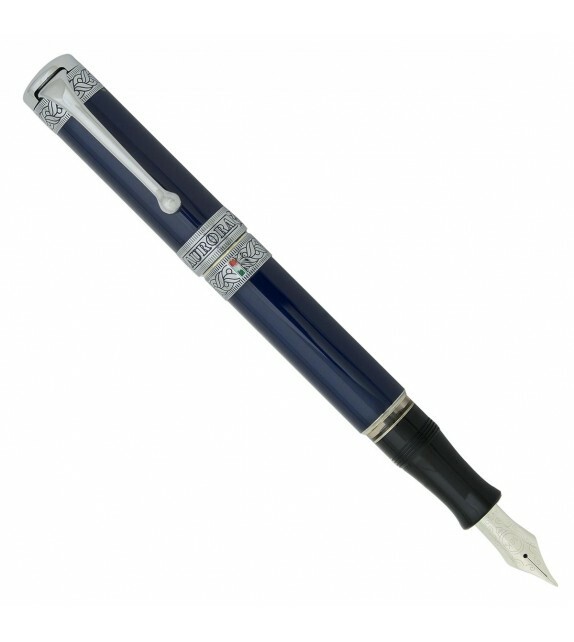 Aurora Dante Purgatorio, fountain pen with blue laquer cap and barrel. 18 Kt. solid gold nib. 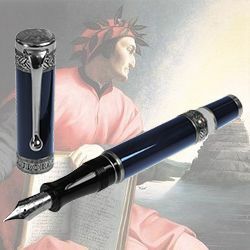 Aurora presents the first pen in its collection designed to celebrate the major Italian poet Dante Alighieri (1265-1321), the father of the Italian language, and his Divina Commedia, widely considered to be among the masterpieces of world literature and included in the 100 greatest books of all times. The Commedia, composed in ancient "trivial florentine language" is divided in 3 parts, and describes Dante's journey through Inferno (Hell), Purgatorio (Purgatory), and Paradiso (Heaven). 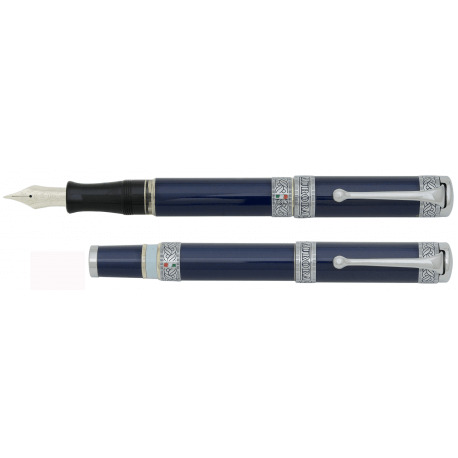 Dante Inferno is dedicated to the first canto of this famous work. 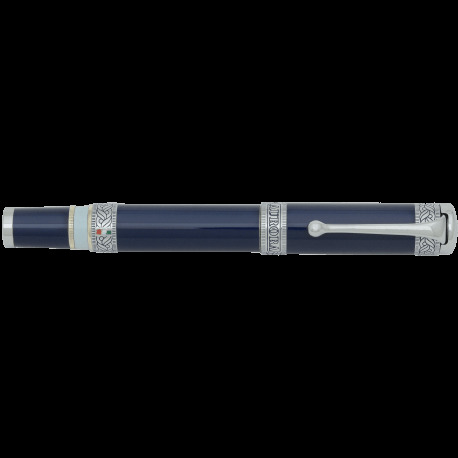 The collection includes the fountain pen model only, realised in colours that recall those of hell: a body in black lacquer with finishing in rose gold, with the addition of a hellish red on the ring. make the Dante Inferno even more unique. 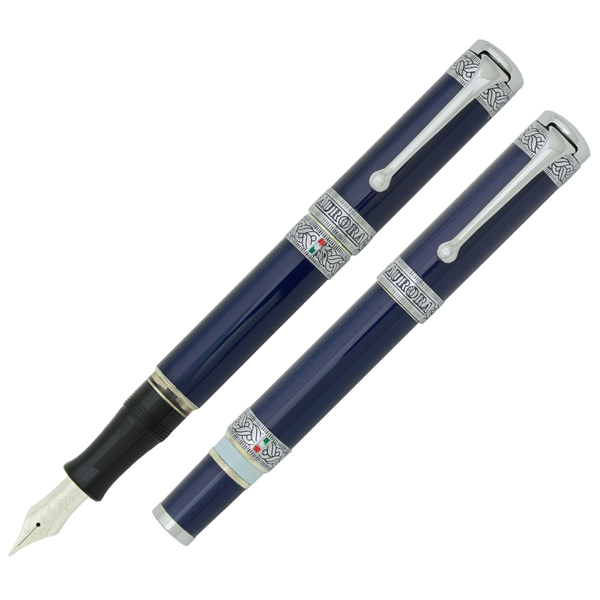 At the cap's top, an engraved Dante’s profile decorates the gold top disc, and the word Italia and the pen's serial number are on the back of the top ring. The central rings are engraved, all around, with the laurel leaves that appears on the Poet's head in all portraits, only interrupted by the lacquered Italian flag on the back, and the name Aurora. 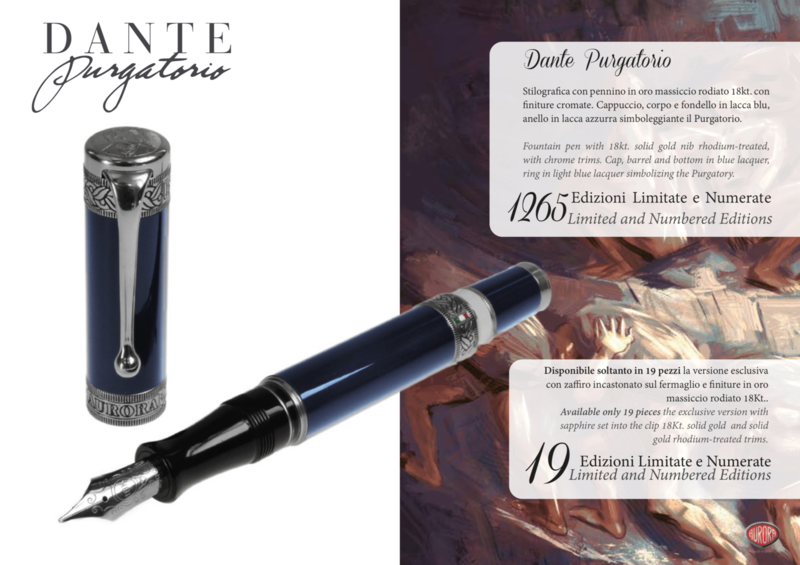 The number of fountain pens of the Limited Edition, 1265 pieces, indicate the birth year of Dante Alighieri. 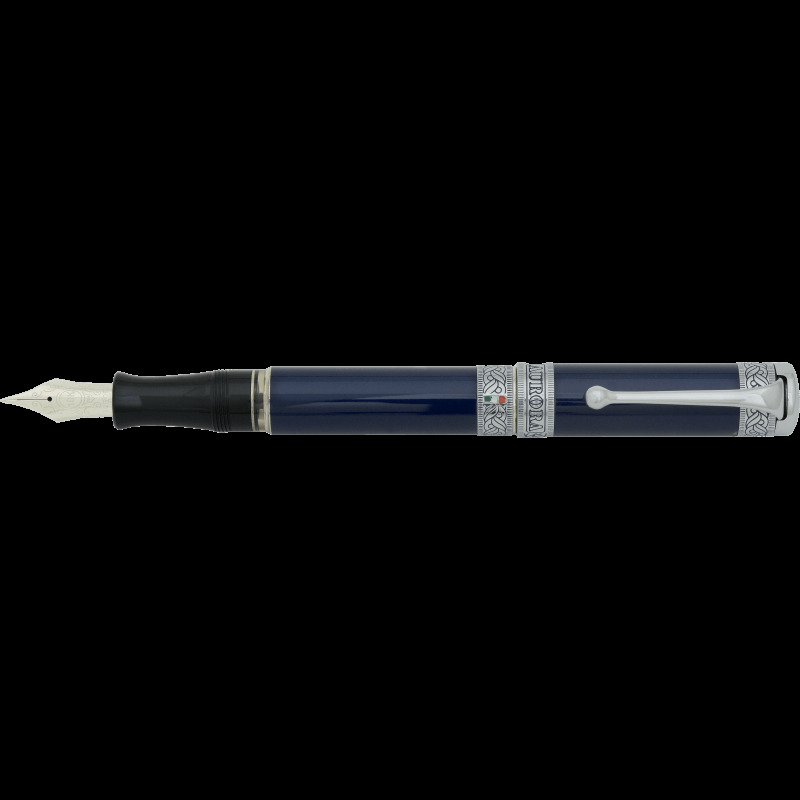 A more precious edition of only 39 pieces is scheduled, in lacquer and solid gold, to symbolize the 3 infernal rivers (Acheron, Styx and Phlegethon) and the 9 concentric circles leading down to the bottom of the abyss. 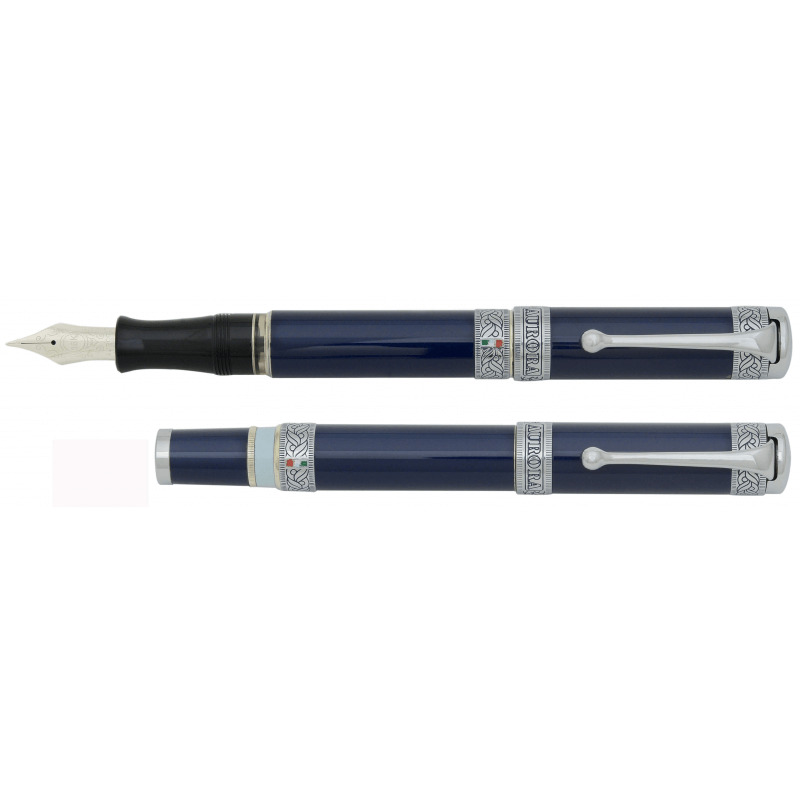 The nib is available with tip: Fine, Extra Fine, Medium, Broad and Special. (F,EF,M,B,SP).